New technologies offer consumers more conveniences and productivity enhancements. These technologies also mean changes in the workplace. The nature of work is evolving and many jobs will be partially or fully automated in the coming decades. How will workers in New York State be affected by automation? Technical advancements and cost reductions in the fields of data processing, computing power, information technology, and sensors have led to the integration of Artificial Intelligence (AI) into the workplace. AI has enabled the automation of tasks that require situational awareness and perception that, until recently, we thought only a human could provide. The result has been incremental changes in the way goods and services are produced and delivered. Artificial intelligence refers to technologies that enable computers to perform tasks traditionally thought to require human intelligence, such as visual perception, speech and pattern recognition, and decision making. Phones are used to place coffee and lunch orders instead of interacting with cashiers. Mobile banking apps provide alternatives to visiting a bank during business hours to cash checks. Self-service kiosks have replaced a portion of checkout lanes at most large retail stores. Big data and IT connectivity advancements have dramatically changed logistics operations, even allowing drivers and passengers to be connected in real time through ride sharing. Automation through emerging AI technology has created tensions within our manufacturing workforce, yet at the same time it has the potential to open doors to significant economic growth and job opportunities. The question is how policymakers and industry can capitalize on the technology while not losing jobs overall. When automation first found its way to assembly lines and replaced manufacturing workers, it was hard to imagine machines handling service jobs that required human traits such as social intelligence, perception, and creativity. But as productivity-enhancing, AI-enabled technologies continue to be introduced, we are at the frontier of a new wave of automation. Economists and policymakers are working to understand the scale and scope of this wave. 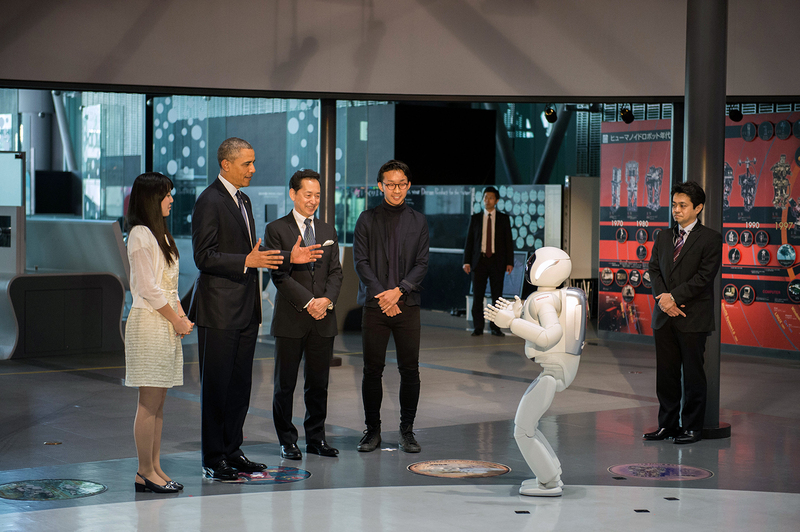 By understanding what is coming, we can take steps now to prepare the workforce and adapt our innovation infrastructure to harness the power of AI and automation to improve productivity, create new industries, and generate economic growth. This analysis is the first in a series of posts and discussions led by the Rockefeller Institute of Government to examine the economic, ethical, and social implications of AI on New York’s residents, workers, and employers. A better understanding of the coming AI technologies and their impacts on employment and quality of life will enable the development of programs, policies, and investment strategies that will assist federal, state, and local leaders in harnessing the full potential of AI. The series begins with the quantification of AI’s impact on the New York labor force. The calculation is based on individual occupations. A recent paper by Frey and Osbourne estimated the probability of computerization of more than 700 jobs in the near future based on the tasks associated with the job and currently available technologies. A high probability of computerization suggests technologies could eliminate or dramatically change the tasks associated with the job in the next twenty years. 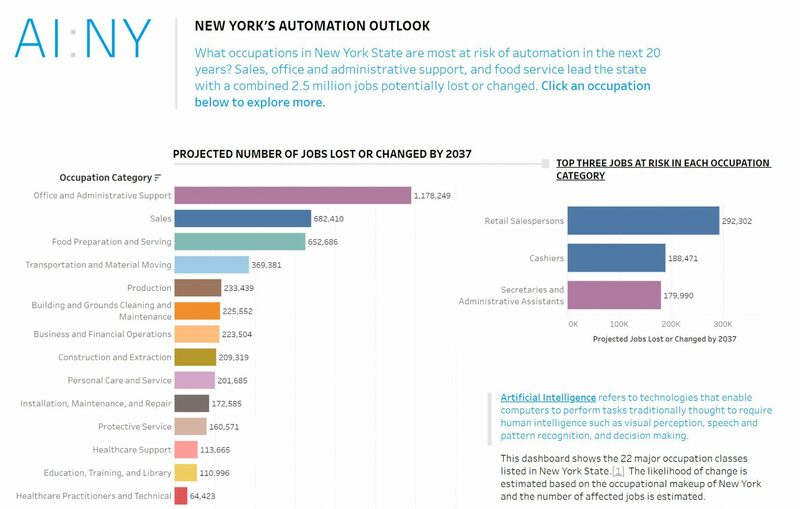 We combined these data with the occupational makeup of the New York State workforce in 2017 and found that 53 percent of jobs in New York could be automated with technology available today or anticipated in the near future, while 56 percent of workers across the US face threats from automation. The data below show the twenty-two major occupation classes listed in order of their share of the New York workforce. The likelihood of change is estimated based on the occupational makeup of New York and the number of affected jobs is estimated. As a point of comparison, we also present the growth trends for the occupations over the last decade. On average, the New York workforce grew by 7.2 percent. Occupations with a higher growth rate are expanding faster than average and those with a lower growth rate are contracting with their share of the workforce declining. Source: Rockefeller Institute calculations based on Bureau of Labor Statistics Occupational Employment Statistics and Frey and Osbourne (2017). The three largest occupation groups — office and administrative support, sales, and food prep and service — represent 35 percent of New York’s workforce. All three also have a high likelihood of automation, with more than 2.5 million jobs potentially impacted, accounting for over half of the future changes in the New York workforce. Salespeople and cashiers: 512,200 people are employed in these professions and the risk of automation in the next twenty years are 92 percent and 97 percent, respectively. This is not unsurprising considering the boom in online sales and do-it-yourself customer service in stores. New York has 11,330 fewer cashiers than it did a decade ago. Despite trends in online commerce, the number of retail salespeople has grown by 43,220 in the past decade. The retail trade industry currently has 810,000 openings. It accounts for 12 percent of all job openings in the US. Secretaries/administrative assistants and office clerks: Advancements in software have allowed professionals to take on more and more of these traditional duties themselves. Research predicts 96 percent of these jobs will be altered or eliminated in the next two decades, affecting 381,790 workers in New York. However, the decline has yet to begin and an estimated 13,700 positions will be created over the next few years. Currently the professional and business services industry has more than 1.3 million jobs unfilled and may be turning to automation to improve the productivity of its existing workers. Food-service positions: Food preparation and serving workers (92%), and waiters and waitresses (94%) which represent 335,920 workers. Despite the dire predictions, the New York labor force has created 133,730 new positions in these fields. The hiring surge has led to shortages around the country with almost one million unfilled jobs in the industry. Automated technologies may be used to fulfill demand for workers that are no longer available. Because of the larger share of highly skilled labor, many New Yorkers will be insulated from the impacts of automation in the near future. Conventional wisdom holds that low-skills jobs will likely be automated first, and they are at the greatest risk of elimination. While AI may enhance their productivity and change the way they complete some of the work, more highly educated employees are unlikely to be replaced through automation. Professions such as doctors, lawyers, managers, and teachers have a low likelihood of automation. New York has a highly educated workforce with 5.8 million (43.4%) residents with a postsecondary degree. One-third of New York’s workforce is employed in occupations with a low likelihood of automation (30% or below) compared with 29 percent of the US workforce. Because of the larger share of highly skilled labor, many New Yorkers will be insulated from the impacts of automation in the near future. As automation and AI are adopted in all industries, it is unlikely New York will see a net loss in jobs. New technologies generate new employment opportunities just as others disappear. The challenge is that those who lose their jobs to automation do not necessarily have the skill set and education required for the new opportunities. While New York has a high number of well-educated workers well positioned to take these new jobs, 14.1 percent of New York residents over the age of twenty-five do not have a high school degree and are likely working in occupations at high risk of displacement. Carl Benedict Frey and Michael A. Osborne, “The future of employment: How susceptible are jobs to computerization?,” Technological Forecasting & Social Change 114, C (2017): 254-80.